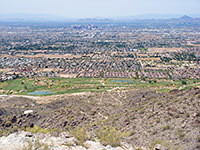 The southern boundary of Phoenix lies some distance beyond the built up area, on the far side of South Mountain Park, but the edge of the main commercial district is approximately along Broadway Road; the land south of here is mostly agricultural or residential. Phoenix Sky Harbor International Airport occupies a large site beside the Salt River, ringed by freeways (202, 143 and I-10) and served by dozens of hotels, mostly located in three districts: along Van Buren Street to the northwest, around the 202/143 intersection in the northeast and in a quieter business district to the southeast. Downtown Phoenix is between 6 and 10 miles west of the airport, while the cities of Tempe, Chandler, Gilbert and Mesa lie to the east. One other natural site in the vicinity is Papago Park, which includes a golf course, zoo, botanical garden, historical museum and hiking trails. The nearest shopping mall (Arizona Mills) is 4.5 miles south of the airport at the end of the Superstition Freeway. One of only three Crowne Plaza hotels in Arizona, the Crown Plaza Phoenix Airport along Washington Street offers almost the closest lodging to the airport, which is just one mile away to the south. Downtown Phoenix is 4 miles away, and all local area attractions are within easy reach owing to the proximity of I-10, I-17 and the 202 Freeway, and also via the new METRO Light Rail, which stops right outside. The full service hotel is one of the larger and more upmarket of those near the airport; it has 298 rooms (all recently renovated) on 10 floors, a large outdoor pool at the rear, a convenience store, lounge, bar and restaurant serving Southwest-style dishes; room service is available. For meetings, the Crowne Plaza has 3 rooms, totaling 5,568 sq ft of space. The full service, 12 story Marriott is one of the closest hotels to Phoenix Sky Harbor Airport - 1.5 miles north along 44th St - and it provides all necessary services for visitors to downtown Phoenix, especially those here on business. Accommodation comprises 347 rooms & suites, all large, brightly decorated and well equipped, with 3 concierge levels available for those needing extra amenities. The hotel's restaurant is Red Rim Bistro, open for breakfast, lunch & dinner, while food and drinks are also served at the Lobby Lounge. Meeting facilities include 14 rooms totaling over 18,000 sq ft of event space. The Marriott is positioned at the intersection of the 202 and 143 freeways, for easy travel to all area locations. The Hilton is part of a group of hotels bordering Phoenix Airport to the southeast, 2.5 miles by road from the terminal buildings, at the edge of an extensive business district alongside the 143 freeway. Free 24 hour airport transportation is available. Central attraction is a large, secluded, tropical courtyard garden with outdoor pool, patio and al fresco dining area, providing a respite from the busy urban surroundings. Breakfast, lunch & dinner are served at Rennick's Restaurant (plus room service), while Rimrock Bar & Grille is open for drinks and meals from late morning until midnight. 10,000 sq ft of meeting space cater for events of up to 500 people. Accommodations at DoubleTree Suites by Hilton are oversized two-room suites, all with wet bar & sofa bed; some have upgraded facilities for business & multimedia. The hotel provides a free shuttle to/from Phoenix International Airport, 2 miles south, and is one block from the nearest stop on the METRO light rail system. Highways 202 and 143 run past close by, for easy travel in all directions. On-site facilities include an all-day restaurant (free buffet breakfast provided), an outdoor pool & courtyard garden, a fitness center and 17 meeting rooms. The resort-like property occupies a spacious site in a relatively quiet business district, surrounded by plenty of parking space and lined by many palm trees. Holiday Inn Phoenix Airport adjoins the University Drive exit of the 143 freeway, less than 2 miles from the terminal buildings, and one mile from interstate 10. The neighborhood has a mixture of businesses and other hotels, with just a few restaurants, though all-day dining (plus room service) is available in the hotel at the Soleil Bistro. The other main facilities at the 114 room Holiday Inn are a lounge/bar, outdoor pool, hot tub, fitness center, business center, gift shop and 3,000 of meeting/event space. A complimentary shuttle is operated to the airport and to other locations within a 5 mile radius. The Holiday Inn is a full service addition to the wide range of Phoenix airport accommodation choices, occupying a large site along 44th Street, 2.6 miles from the terminal buildings, and a similar distance from many southeast Phoenix attractions including Papago Golf Course, Phoenix Zoo, Arizona Country Club & Pueblo Grande Museum. The 234 modern, luxurious rooms are arranged around an attractive courtyard garden with pool, whirlpool, gazebo and mature trees; inside, the main facilities are a full service restaurant, lounge/bar, 24 hour fitness center and 12,000 sq ft of meeting space catering for functions of up to 400 people. The hotel's complimentary shuttle serves the airport and all places within a 5 mile radius. Adjacent to a Marriott sister property (the Fairfield Inn), Courtyard Phoenix Airport is quite a large building of 4 floors and 145 rooms, a five minute drive from the airport via the hotel's complimentary shuttle, which also serves nearby locations in Tempe. The inn is built around a lovely garden area with a pool & hot tub, lined by palm trees and other plants; it provides comfortable, quiet lodging in the care of friendly staff. Services include a business center, two meeting rooms, free continental breakfast and guest laundry. Within easy reach of as Mesa, Tempe and Scottsdale as well as Phoenix and the international airport, the Residence Inn by Marriott offers high quality accommodation for long or short stay travelers, and its combination of good facilities, efficient staff and general cleanliness makes this one of the top rated hotels in all of Phoenix. The 200 rooms feature separate living/working/sleeping areas plus a full kitchen, pull-out sofa bed and large work desk; some have a fireplace. Complimentary services include full breakfast, light evening dinner on selected weekdays, airport shuttle and parking. For relaxation, guests have use of an outdoor pool, hot tub, sports court, bbq area and fitness center. The AAA Three Diamond-rated hotel occupies quite a large area along North 44th Street, beside the junction of the 143 and 202 freeways. Guests at Homewood Suites by Hilton Phoenix Airport are treated to free hot breakfast every morning and a free evening reception (Mon to Thu), when snacks and drinks are served. The well reviewed hotel features two bed, one bed and studio suites, with extended stay amenities including a full kitchen, two phones, free internet access and an extra sofa bed. Some of the rooms look inwards over the courtyard garden; others have views over the busy neighborhood of restaurants and business premises, along 48th Street, 5 miles south of the international airport; also nearby is the Tempe Diablo Stadium. Leisure facilities are the expected fitness room, outdoor pool and whirlpool, while the hotel also has services for business, meetings and events. Along Van Buren Street, the Hilton Garden Inn is a large, modern property offering a 24 hour business center, complimentary airport transportation, an outdoor pool and meeting space for up to 200. Freshly-cooked breakfast is served in the Great American Grill, plus dinner (and room service) in the evenings, while drinks & snacks are available from the Pavilion Lounge. Guests can also cook meals in their rooms, using the refrigerator & microwave; food can be purchased from the Pavilion Pantry convenience store. The hotel is built in a partly residential, partly industrial neighborhood beside the Grand Canal, which has a hike/bike trail along the south bank. The light railway runs past one block south. Hilton Garden Inn Phoenix Airport benefits from a quiet location along a side road, near the 32nd Street exit of Interstate 10; especially peaceful are the outdoor pool and garden at the rear, enclosed by palms and other shady trees. The complimentary airport shuttle and business center both operate 24 hours a day, while the many other facilities include a restaurant, bar, convenience store, fitness center and meeting space. The restaurant is open for breakfast, lunch & dinner, convenient since there are no other dining places in the vicinity; the surroundings are a mixture of business premises and industrial sites, close to the south bank of the Salt River. The more northerly of two Hampton Inn hotels serving Sky Harbor Airport is part of the Gateway Business Complex either side of 44th Street, right opposite COFCO Chinese Cultural Center. A free shuttle takes guests to and from the airport, less than 2 miles away; for other destinations, the light railway runs past 2 blocks south (also served by the shuttle). The hotel has 106 rooms & suites, all equipped with a work desk, sofa bed, refrigerator and microwave. Four meeting rooms can accommodate events of up to 100 people. Free hot breakfast is provided, available in a take out version for guests leaving early (Mon-Fri only). Newly constructed late 2019, the Holiday Inn Express is an affordable, mid range property of 128 rooms & suites, situated along 44th Street just south of the 202 freeway, 1.8 miles by road from the international airport. In the vicinity are business premises, other hotels and a couple of restaurants; the nearest natural scenery is Papago Park, 2.5 miles east. The main hotel features are a free five mile radius shuttle service, free hot breakfast, a fitness center and an outdoor pool. The best aspect of the Holiday Inn Express, regarded by many as the top hotel at Phoenix Airport, is the rooms - extra large, modern and beautifully maintained, equipped with a microwave and a full size refrigerator. The hotel is part of a quiet business park near I-10 exit 151 (University Drive) - due south of and 3 miles by road from the international airport. Also nearby are Arizona State University (4 miles) and the Diablo Stadium in Tempe (3 miles). Guests can take advantage of free buffet breakfast, free evening reception, free airport transportation, a fitness center, outdoor pool, hot tub and gift shop. One mile southwest of Phoenix Sky Harbor international airport, the 2 story Best Western Airport Inn occupies quite a large site just south of I-10, along 24th Street. It is accessed from exit 150 of I-10, one mile east of the junction with I-17, so has good links with anywhere in the Phoenix area. The full service hotel has 117 nice clean rooms, an outdoor pool/hot tub, free airport shuttle, guest laundry & meeting space, and is connected to a restaurant/lounge open for breakfast, lunch and dinner (room service available). 2.5 miles by road from Phoenix International Airport, the Sleep Inn offers all the expected amenities for a mid range airport hotel; free deluxe continental breakfast, outdoor pool/hot tub, free airport shuttle, and a quiet night's sleep, as it lies a little way south of the main flight paths. The 105 rooms are small to medium sized and contain a microwave & refrigerator. The hotel is next to the 143 Freeway (Hohokam Expressway) and a mile from I-10 so within easy reach of other sites in south Phoenix. Wi-fi, continental breakfast (with hot waffles), parking and 24 hour airport transportation are provided free of charge at Howard Johnson Phoenix Airport, an exterior corridor hotel along Van Buren Street, 2 miles by road north of the terminals. Accommodations are contained within two blocks, facing south or east, with views of the parking lot, the outdoor pool, and beyond to a small business park that includes such businesses as Hanson, Magellan Health Services and Health Choice Arizona. Guest rooms are equipped with a refrigerator and microwave. People here to work have use of a business center and a 15 person boardroom. The west-facing accommodations at Days Inn Airport Phoenix overlook a sizeable garden with outdoor pool, palm trees and picnic area, surrounded by a mix of residences and business premises on Van Buren Street; 3 miles east of the city center and 3.5 miles from the international airport (free 24 hour shuttle provided). The neighborhood has a small choice of restaurants, the nearest being half a mile south along Washington Street, Free continental breakfast is provided. For budget Phoenix Airport accommodation, the Econo Lodge is a good choice - a simple, U-shaped, 2 story, exterior corridor motel along busy Van Buren Street, 3.5 miles from the terminals and served by free 24 hour shuttle. The 95 rooms are fairly standard though a few have hot tub baths. Free continental breakfast and an outdoor pool are the two main amenities; for lunch & dinner there are a few restaurants a block or two away along the main road. Three attractions within walking distance of Motel 6 Phoenix East are Papago Golf Course, Papago Park and Tovrea Castle; the motel has an easily-reached location at the Van Buren Street exit of the 202 Freeway, 2.6 miles from Sky Harbor Airport, adjoining a small residential area. There are several restaurants within half a mile, though none adjacent. The motel has a tree-lined outdoor pool at the front, and it provides free coffee in the mornings. Rooms are available with microwave and refrigerator. Motel 6 Phoenix Airport is 2.4 miles by road from the central airport terminal area, located beside the northwest perimeter along 24th Street, one block east of Interstate 10. Guest rooms are on two floors, overlooking the parking lot and outdoor pool. The motel is part of a generally business/industrial neighborhood, though within walking distance of a few restaurants, to the north. The 24th Street/Jefferson light rail station is also close by. Wi-fi and free morning coffee are the only amenities.